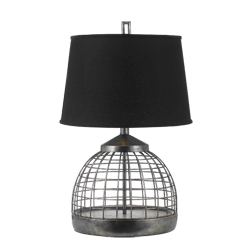 Our industrial Grid accent lamp is hand-crafted of hand-welded metal, finished in antique pewter. The shade is black poly linen which off sets the industrial hard edge. Due to hand-crafting no two are alike.